In my young days, I learned to play the harpsichord. Ocasionally, I had the opportunity to play a church organ. In these days, I wrote a tiny composition. 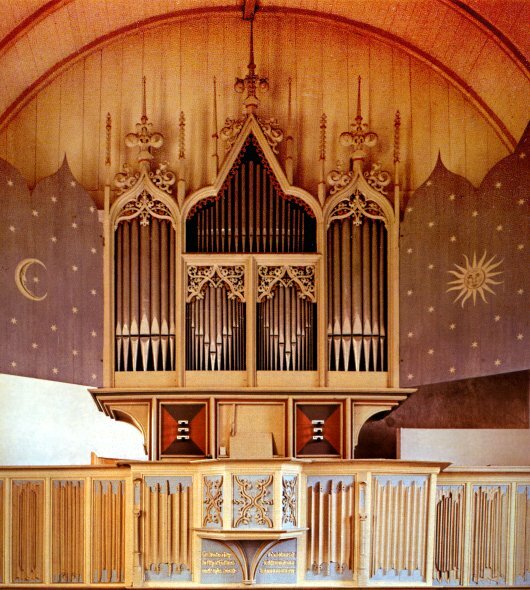 As it happened, Harald Vogel was preparing a gramophone record of the Gothic organ at Rysum in Northern Germany, and my father was the recording engeneer. I gave my composition to Harald and he played it during one of the recording sessions in February 1982. The organ, one of the oldest in Germany dating back to the 15th century, is tuned in meantone temperament. This temperament emphasizes the style of my composition. I converted the 15 ips tape recording to organ.mp3 (40 sec, 642 kB). Harald Vogel is recognized as a leading authority on the interpretation of German organ music from the Gothic, Renaissance, and the Baroque periods. Check the ORGANEUM for more information.